Microsoft announced a major addition to the Surface line at an event in New York on Tuesday: the Surface Book, a 13.5-inch laptop/tablet hybrid with some serious hardware inside. It's Microsoft's first laptop. The Surface Book includes an Intel Skylake Core i5 CPU (or i7 in more expensive models) CPU, Nvidia GPU and a claimed 12 hours of battery life. According to ZDNet, the Surface models will come with 128GB-512GB SSDs and 8GB-16GB of RAM (although the video above claims up to 1TB of storage). 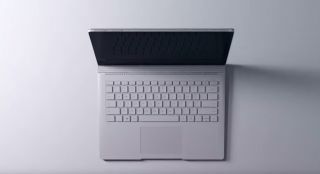 The Surface Book's display detaches from its keyboard base, which houses the GPU and ports, to become a 13.5-inch tablet. The "fulcrum hinge," as Microsoft calls it, can also bend backwards to support the screen in a tablet position. The 128GB, Core i5 configuration of the Surface Book starts at $1500, and models scale up to $2700. We don't know what Nvidia GPU Microsoft's put in the Surface Book, but having a discrete GPU already makes it a much more promising gaming system than most hybrid tablet systems out there. Unfortunately, the base model doesn't contain the Nvidia GPU. As shown from ZDNet's pricing info, you'll have to step up to the $1900 model to get dedicated graphics. The Surface Book will be available on October 26. Microsoft also announced the smaller Surface Pro 4 for $900. It won't be as powerful a gaming system, but you can read more about it over on MaximumPC.